Most of us are blessed with a pair of kidneys because kidneys play a significant role when it comes to maintaining your overall health. However, with time certain symptoms may erupt which may require your physician to recommend you getting your kidneys checked just to see if they are functioning well. This post will help you understand how to prepare yourself before you go for a kidney function test or KFT. Out of the several functions which kidneys perform, the main function which it performs is filtering out waste or excretory materials from the blood. These materials are released in the form of urine. Apart from this, kidneys are also responsible for regulating and maintaining the water as well as essential minerals level in the body. And last but certainly not the least, they are also instrumental in producing red blood cells, vitamin D as well as some essential hormones which regulate blood pressure. ü Difficulty while beginning to urinate. However, one thing which you must understand is that occurrence of any single symptom may not immediately mean that it is sue to kidney disorder. Only when all or most of these symptoms happen simultaneously, then you must understand that you need to undergo a kidney function test. Usually a Kidney Test comprises of a blood and a urine test. Only when you undergo this test that your doctor will be able to understand your Glomerular Filtration Rate (GFR). It is this GFR which helps your doctor ascertain if your kidneys are performing their function of clearing excretory waste from the body. KFT cost in India is not is very high. KFT price is somewhere around eight hundred rupees which is quite affordable. 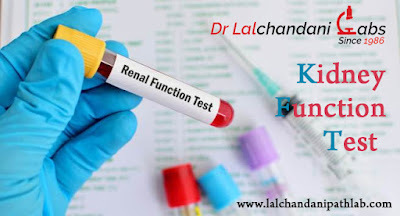 And if you opt for a reputed pathological laboratory like Dr. Lalchandani pathological laboratory which not only provides customers with the convenience of making a booking of KFT Online but also provides affordable check up packages as well. So if you want the best technology at affordable rates, then Dr. Lalchandani Labs is the perfect place to go! I found it really nice and pretty well maintained. Thanks for sharing valuable information with us. I would like to bookmark this page so i can come here again to read your blog, as you have done a really wonderful job.